NeoNatalie is realistic in size and appearance with natural weight and feel when filled with lukewarm water. Including features such as spontaneous breathing, palpable umbilical pulse, and crying, NeoNatalie can be used for role-play scenarios such as normal post-birth care, standard resuscitation, and resuscitation measures including positive pressure ventilation and closed chest compressions. 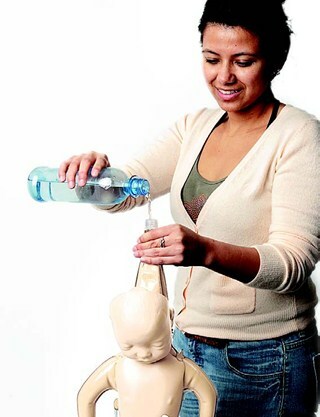 NeoNatalie is easily prepared for use by filling the body with two liters of water, or alternatively with air. NeoNatalie facilitates practice in effective bag-maskventilation. Chest will only rise with correct technique. The squeeze bulb lets you simulate birth cries, spontaneous breathing and palpable umbilical pulse. 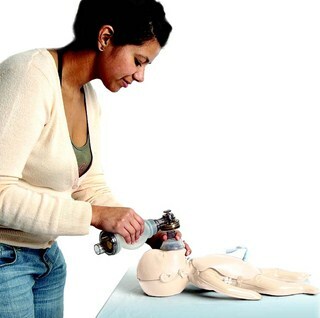 NeoNatalie was developed to help train millions of birth attendants in developing countries in neonatal resuscitation courses, such as Helping Babies Breathe.